I had a Twitter friend, a pretty normal lady, who had a baby a few years ago, but then I think having the baby must have given her brain disease. Of course I won’t fault a new mother for shifting to discussing baby things more, because it’s unrealistic to expect a mom to totally avoid talking about her child, but she got angry, too, at the other moms who didn’t do things the way she did. Messages I got from her included things like: Mothers who give their children processed foods are child abusers. Mothers who let their children cry too long are child abusers. Mothers who feed their babies formula are child abusers. Don’t even get her started on women who feed their children formula and let them cry too long. It was hard for me to let this roll off my back (I was formula-fed, so was she saying then that my mother was a child abuser, and, follow-up question, would this woman like to meet me outside? ), but I bit my tongue, because what did I know. But if I could ask her one thing, it would have been, "If your child is so fulfilling and you’re such an expert, why are you on Twitter so much? Shouldn’t you be off staring at your child as he sleeps or making him some food or knitting him some reusable diapers or planning his agenda for the day?" This lady was giving herself away. Despite her self-righteousness and know-it-all-ness, she was also bored and lonely and could probably use a pal. Finally, I read the article this weekend, and what I read was a piece that was reaching. Really what it was was an article about some women who choose to stay at home because they weighed the pros versus cons and felt more in favor of staying at home instead of working, but, because they are normal human beings, weren’t totally sure this is what they want to do for forever. 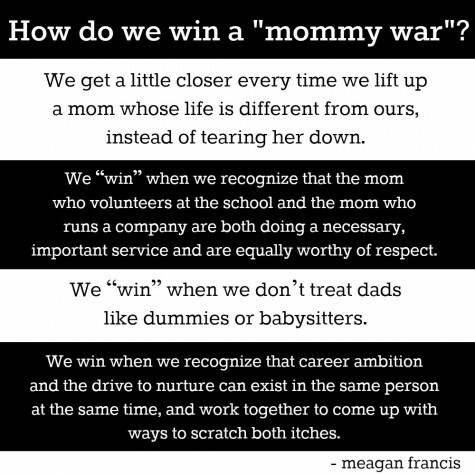 This was surrounded by a lot of quotes and stats from studies about how more women are doing one thing and feminist theory these days says another and women are good at this and dads are good at that. It was an article about some women doing one thing that was being gussied up as a trend. Like my friend on Twitter, I think the Internet can be a blessing and a curse for new moms. A woman who isn’t 100% sure of her choices can reach out and find like-minded folks online (or the opposite), but sometimes a sense of community turns into backlash. It turns women who don’t want to be ogled or criticized for breastfeeding into women who claim those who don’t feed their children the way they do are selfish. It turns women who feel ambivalent about going back to work into those who say stay at home moms are mindless cows. Here&apos;s what I think: in the end, it really doesn’t matter what you do as long as you aren’t selling your baby to a child pornographer or strapping your baby to you before you leap out of a 13-story building (sadly, these are both real things that have happened this month.) We need to look at the big picture. I mean big. Pull out farther. Farther. Farther. Farther than that, even. There you go. I feel a little bit sad that I even felt compelled to write a post that’s along the lines of “Can’t we all just get along?” but if women can get a little bit smarter about spotting the attempts in the media to get us to start attacking each other with “reaching” pieces, maybe if we can sense when the Internet stops being a release and starts becoming a trap, maybe that will help us look at the big picture instead of fighting each other over the details.